Do you love playing word search? 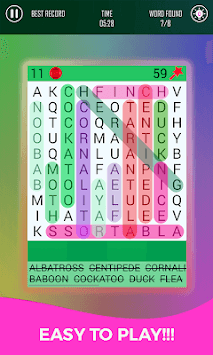 Here is the right app for Word Finder Puzzle. We are proud to present this educational entertainment tool. This Word search games app is a completely free app which keeps you engaged for an hours with hectic entertainment. - This word search puzzle game provides multiple colorful themes selection. - Daily word challenge available in this puzzle word games. - This Find words game is a powerful brain teaser for all ages. - You can challenge your opponent with 200 coins and find words faster to be the winner! Time to download Word Finder Puzzle - Smart Link Word now and try the most powerful brain teasers of word search game of all time now. Find all the hidden words among those lines, and sharpen your brain one find at a time! Wait no more. Enjoy this unique multiplayer word search game today.